Sorry – I couldn’t find a pic of Herod Farm. So you can enjoy a photo of Shelf Moor instead. The ever popular Herod Farm Fell Race is the traditional first mid-week local fell race. As in previous years, in 2019 it is kindly sponsored by Joe Barber Plumbers Merchants located on Glossop High Street. Once again we would like to thank the support of Reliance Garage, Turnlee Road, SK13 6JR for providing Race HQ facilities. This is an “A Short” (short, but steep) category fell race, with minimum age 14 years. Entry £3 on the night. No pre-entry.start. Registration (and parking) at Reliance Garage SK13 6JR, will be open 6:15pm – 7:15pm, and will close in time for the race start at 7:30pm. There is a 10 minute jog from registration to the race start. Results and prizes back at the garage after the race. The race route is mostly off road and covers narrow paths and uneven terrain, with steep, grassy climbs and descents. Whilst we do not require competitors to have previous experience of fell racing, we do recommend that they have some experience of running on this type of terrain. The course will be partially marked with flags and will be marshaled at key points, however competitors should have the necessary navigational skills to find their way around the course in the prevailing conditions, in expectation of no support. All competitors have primary responsibility for their own safety. a) Windproof whole body cover. b) Map and compass suitable for navigating the course. Final kit requirement (as specified by the Race Organiser – based on conditions on the day). will be on display at registration HQ on race night. Check you have the correct kit before registering. A map is available below. Competitors should be able to recognize the signs of hypothermia, hypoglycaemia and heat exhaustion in themselves and others. If you see someone in trouble you MUST stop and help even if it costs you the race. Competitors either failing to start after registering or retiring at any point during the race MUST notify the officials at registration HQ or at the Start/Finish, and the nearest marshal if appropriate, before leaving. Finish line Marshals will be operating a number matrix to keep track of runners. Race HQ: The Reliance Garage on Turnlee Road, Glossop SK13 6JR (GR SK-028934).. This is about half a mile along the road from the start of the race, so allow time (10 mins plus) to get to the start line. Parking: Limited parking at Reliance Garage and also limited parking in Primrose Lane and surrounding streets. Please car share and show consideration to local residents when parking. 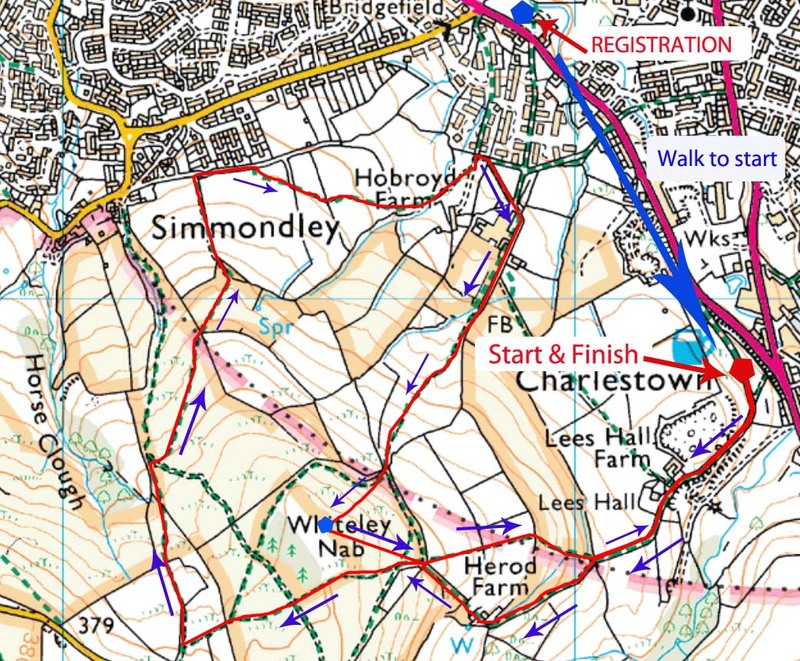 The race route starts from a track (GR 033937) off Primrose Lane (A6016), near the junction with the A624 Glossop to Hayfield road, and continues through Herod Farm nearly to the top of Monks Road, from where it descends towards Simmondley. After dashing through fields past the Pennine Care Centre the race begins in earnest, climbing up the face of the “Nab”. Finally, athletes retrace their route back down via the farm track to the finish. The race was first held in 1989 and the race winner for five years was Andy Trigg. The men’s and ladies course records were both broken in 2007 by Lloyd Taggart and Natalie White. Each year the 1st lady receives the Stella Judd Memorial Shield. This trophy was presented to the club by Andy Wilkins in memory of his wife Stella, who was once also a keen runner, but who died in 2005. A note about the course: Please note that on the first climb the route takes the public right of way through Herod Farm which is a private residence. Please do show consideration to the owners of Herod Farm when running past the house. There will be a marshal at the gate onto the moor. That is indeed correct. No kit, no race.